Denki: the electric cube? | What Car? 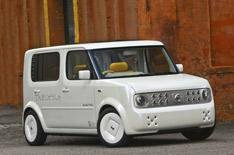 At the New York motor show in March, Nissan presented an all-electric version of the 2002 Cube. Called Denki (the Japanese word for electric), it had a motor powered by laminated lithium-ion batteries. These are more compact than conventional batteries, while being twice as powerful and more stable. The entire drive system was mounted beneath the rear seats, which demanded that the wheelbase be increased by almost 250mm. So, might the new Cube be sold with a plug-in electric motor one day? With Nissan committed to having electric vehicles on the market within the next two years, we wouldn't be at all surprised. Even the need for a longer wheelbase need not be an obstacle the outgoing Cube was available in stretched seven-seater form called the Cube Cubic, and the new one may well get the same treatment, providing Nissan with a ready-made platform for an electric model.